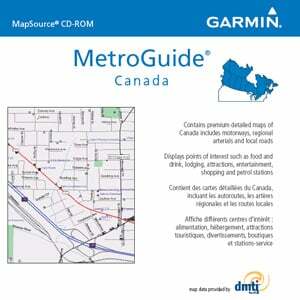 MetroGuide Canada provides detailed maps and points of interest throughout Canada for marine and handheld Garmin devices that cannot display turn-by-turn routes. MetroGuide offers detailed maps using DMTI Spatial map data for all provinces in Canada, including provincial highways, controlled access highways and local roads. 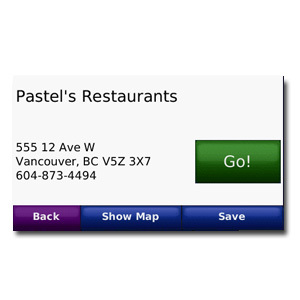 Search for almost 1 million points of interest, including restaurants, fuel stations, lodging and attractions. MetroGuide also includes trip planning software for your computer, so you can save and transfer waypoints, routes and tracks between your computer and device. Click the map to launch our interactive map viewer. Pan and zoom to see detailed roads and points of interest included with this purchase. Contains detailed maps for all of Canada. Contains DMTI Spatial map data. Displays over 900,000 points of interest throughout the continent — restaurants, lodging, attractions, fuel stations, shopping and more. Lets you search for addresses on the computer or your compatible Garmin device. Includes provincial and local highways as well as local, county and residential roads. 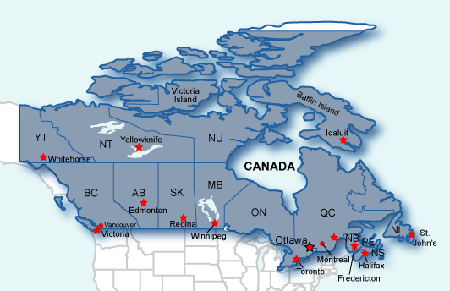 Includes general lake coverage throughout Canada. 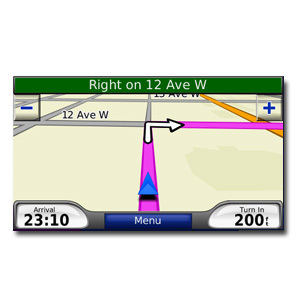 Includes MapSource, computer software that lets you plan trips on your computer and transfer waypoints, routes and tracks between your computer and your Garmin device.